. @TeddyOutReady: Travel Back - Young Sheldon: The Complete First Season Now Available on DVD | WarnerBros. Travel Back - Young Sheldon: The Complete First Season Now Available on DVD | WarnerBros. Young Sheldon series takes us back to the time when future eccentric physicist Sheldon Cooper lived in East Texas with his family. Growing up in a state where most boys are usually into sports is not easy for 9-year-old math and science prodigy. Sheldon skipped four years at school and joined high school to be in one class with his older brother George Jr. Sheldon's dad works as a football coach in the same high school and tries to deal with his son, whom most people, except science professors, call weirdo. Sheldon's mother Mary, may be not often understands her son but she does the best to help him in every situation. She is very patient, loving and protecting. Sheldon's twin sister, Missy, who does not like all the attention Sheldon gets but she is smart her own way and not as naive as her brother is. And finally, here’s Sheldon’s beloved Meemaw, his foul-mouthed, hard-drinking Texas grandmother who’s supportive of her grandson and his unique gifts. Being smart is a gift and a curse at the same time. While Coopers family likes that Sheldon does their taxes every year with a sweet return, can work very well with football team's statistics, and help grandma Meemaw with her gambling hobby, the young boy's mind is more than just numbers games. Young Sheldon wants to help NASA to solve their problems, he is ready for somewhat big and extraordinary to create. Young Sheldon Cooper often outsmarts his teachers at school and they hate that. Teachers and the principal were relieved when Coopers family was offered to send Sheldon to a special school for gifted children but Sheldon's dad George took him back home because the Coopers missed Sheldon terribly. Not all the time Young Sheldon is pursuing his journey in science and math. He once fell in love with geology teaming up with his new friends. But that came to the end and young boy turned it into more like hobby not the main subject. Another time Sheldon decides to give up science after he did not get first place at High School Science Fair. He turns to drama and theatre and eventually gets the lead role in "Annie" musical. You should watch Cooper's family reaction when Sheldon says he plays Annie. And Sheldon refuses to pursue music career either saying that musicians take drugs. And that is not the option for the boy who is crazy about cleanliness, hates dust, germs and dirty places, afraid of dogs, cats and wild animals. For science genius everything should be organized, predictable and according to the rules. Though real life shows that this can hardly be true and we like when naive Sheldon fights to make world better. He is sure that cheating during school exams is totally wrong, teachers and students should follow dress code rules and that "hell is other people". 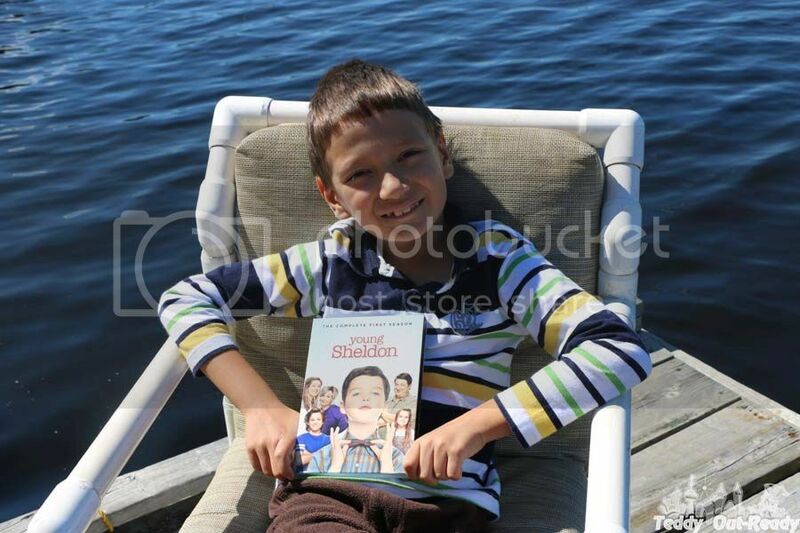 Teddy did not watch The Big Bang Theory, but he likes Young Sheldon series, perhaps because the boy is his age. We laughed so hard and now Teddy can't wait for the second season. Young Sheldon: The Complete First Season is available on DVD September 4, 2018. The release includes 2 disks with 22 remarkable episodes. The DVD also comes with subtitles in English, French and Spanish! Young Sheldon is a pretty good show and I enjoyed watching it!